Each-way comes to the exchange - no need to bet anywhere else now! "What we haven’t previously offered is the ability to place Each-Way bets in the traditional manner, where a single bet comprises a win bet and a place bet at a fixed fraction of the win price. That’s now changing and, from this week, we’ll be offering increasing numbers of Exchange Each-Way markets." What is an Exchange Each-Way market? What effect do non-runners have on my bets? Each-way markets will share reduction factors with the corresponding win market. 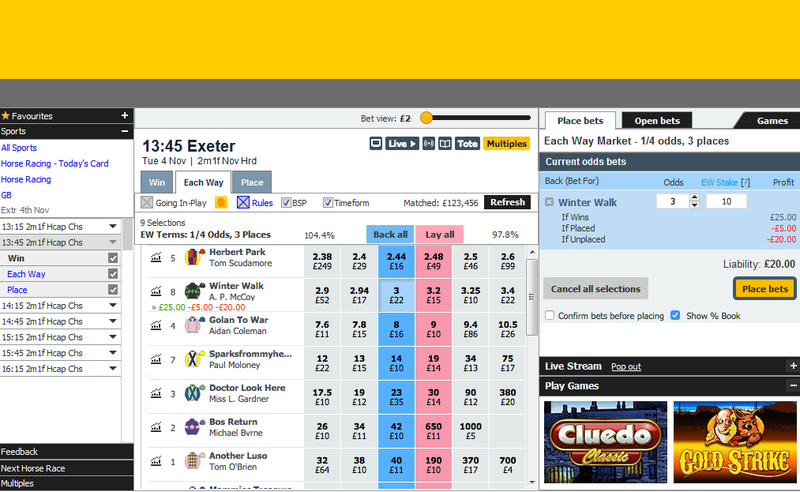 For more information, see the "Betfair Non-Runner Rule" section of our Rules and Regulations. For example, if a runner was removed from the market above with a Reduction Factor of 50%, our £10 EW bet at [11.0] would become a £10 EW bet at [5.5] and the corresponding odds for the place portion would be [1.9]. Like Exchange place markets, the terms of the place portion of the bet do not change with reduced numbers of runners, so our bet will (almost) always pay out the first three horses home as winners for the place portion. In the very rare occasions that so many horses are withdrawn that the number of runners is equal to or fewer than the number of places paid (eg in our market, if three or fewer horses were left in the market) then the place portion of the bet will be void and stakes returned at settlement. Where do I find Each-Way markets? On our desktop and mobile websites. We're working to bring Each Way to our iPhone app later this year. You'll find "Each Way" nestling between "Win" and "Place" markets on an increasing number of races. We always appreciate your feedback, so please leave your thoughts in the comments section below or tweet @BetfairExchange.